"Victor Carlston, don't you think it's wicked to sit here enjoying yourself while your dearest relative lies at death's door?" Dorothy looked at me like I was dim-witted. "Whales can spend their money anywhere. They want to attract them to their casino, instead of Vegas or Atlantic City. Sometimes, whales win and take the casino's money. More often than not, they lose, and the casino's clean up." I love cozies set in bookstores. Thanks for sharing, and for visiting my blog. "Whales" is casino-speak for big spenders. Myself, I'm something smaller than a minnow...maybe, phytoplankton. I like the quote from page 56. The cover is so cute. I see your TBR MOUNTAIN - mine is just as bad. How do you get it to move from screen to screen? Click on the heading and it will take you to my LibraryThing Profile. Then you can click on the To Read collection to see all 2168 books. I want to know how to make it move. Is that a widget in LIbraryThing? Yes, it's a LibraryThing Widget. Best you can do is cycle through at 10 seconds a screen. Books about Books/bookstores/libraries are always fun to read! That looks so cute! Autumn always puts me in the mood for cozies. What a cute cover! And I love that opening. 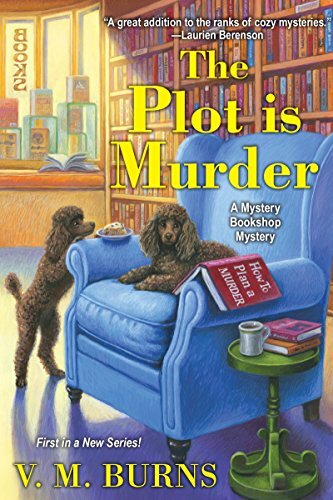 I do enjoy a cozy mystery. :-) I hope you love this one, Kathy. You've left me curious for more with those snippets. Happy Labor day weekend! Sounds like a lot going on with opening a bookstore and writing novels plus solving a murder. I'm tired just reading about it all. :-) Hope you enjoy it. Like the cover as well as the story. Have a good weekend. It's a dog one! I read my first ever cosy mystery last week. It was fine, but I wasn't blown away, so I don't see myself desperately seeking more, though neither would I avoid them. Fall and Winter seem like the best seasons to pick up a cozy read. Hope you enjoy the weekend! I checked out your Goodreads review and can see just how much you enjoyed reading this one. I know the series has since moved on apace, but as you have introduced me to the first installment, it seems like a good oppotunity to add it to my own list, so thanks for the recommendation. Any book, involving books, has to be worth serious consideration, although until I read the author profile, I was struggling to see where our canine friends fitted in!